Posted on November 22, 2016 at 10:51 am. New Queensland casino would become the fifth in the state alongside Jupiters Gold Coast. A brand new casino is being considered for Queensland – the state with the most land-based gambling venues in Australia. It has been reported the state government will hold confidential discussions to decide whether a new casino should be built in regional Queensland. A spokeswoman for the State Development Minister, Dr Anthony Lynham, has said the proposal of a new project is being considered by a team set up by the government. “Team members will include Treasury and Office of Liquor and Gaming Regulation officials who will outline the state’s laws and policies and also the strict probity requirements,” the spokeswoman said. This follows Dr Lynham detailing to parliament on November 3, preliminary research had commenced with local governments, as well as casino and hotel operators, developers, financiers, and construction firms. “My Department of State Development has begun preliminary research to determine if there is genuine interest in the marketplace in another regional integrated resort development,” he said. “They have prepared a participant’s package which provides an overview of the opportunity and Government parameters. One pressing topic is where the new integrated resort development (IRD) could be based, with Rockhamptom, Townsville, Mackay, the Gold and Sunshine Coasts, and Cairns all potentially meeting the criteria. The latter is an interesting option given Aquis pulled out on building the Great Barrier Reef Resort project only recently. The criteria the new project would have to meet would be based on boosting international tourism and be in or close to a major centre with a population no fewer than 150,000. It would also need to to in close proximity of an operational international airport and have a solid transport system. “We are only interested in developments that will draw international tourists to Queensland and create jobs,” Dr Lynham said. Another front runner for the casino project is Toowoomba with an interested party in the region already said to have been approached by developers. Executive Chariman of Toowoomba and Surat Basin Enterprise (TSBE) , Shane Charles, said the interested party had been in contact with the team as part of the discussions. “These are very early stage conversations being held by an interested party in the region,” he said. “Formal discussions around the licence may be held after the recommendations are handed down in early 2017. “We will assess the application criteria and liaise with stakeholders in the region. It is reported the research will be presented to the Queensland government in 2017, where the next stage would be seeking formal expressions of interest. 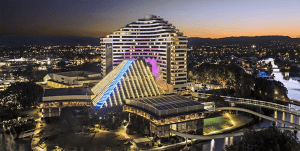 With Jupiters Casino located in both Townsville and Gold coast, Treasury Casino in Brisbane, and The Reef Hotel in Cairns the state has its fair share of casinos. Whether or not this project will get approval won’t be revealed until 2017, but for now our money is on Cairns following the bid withdrawal by Aquis. While waiting for these grand projects to come to fruition, Australians can readily enjoy the world’s best online pokies and table games experiences from the comfort of home thanks to online casinos. Our top recommendation for our readers is Raging Bull Casino, where you can claim a generous sign up bonus package just for registering and depositing for the first time.